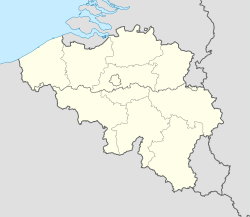 Londerzeel (Dutch pronunciation: [ˈlɔndərzeːl]) is a municipality located in the Belgian province of Flemish Brabant. The municipality comprises the towns of Londerzeel proper, Malderen, Steenhuffel (home of Palm Breweries) and Sint-Jozef. On 1 January 2006, Londerzeel had a total population of 17,435. The total area is 36.29 km² which gives a population density of 480 inhabitants per km². Their football team is K. Londerzeel S.K..
Gerard Walschap (b. Londerzeel-St. Jozef, 9 July 1898-Antwerp, 25 October 1989), writer. Kris Van Assche, fashion designer. Londerzeel has been twinned with Gladenbach (Germany) since 2010. This page was last edited on 3 October 2018, at 06:01 (UTC).